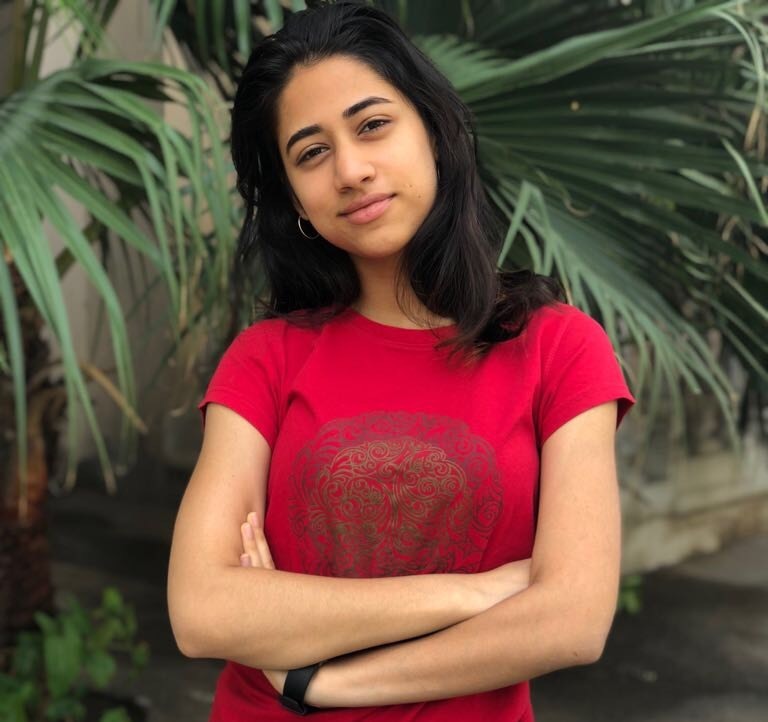 16 year old Iteeva Pande’s life has undergone a dramatic change ever since she auditioned for a Mirinda advertisement early last year. The ad was shot by director Shoojit Sircar who liked her spontaneity so much that he didn’t only finalize her for the ad but also went on to cast Iteeva in his upcoming film ‘October’ alongside Varun Dhawan and Banita Sandhu. October, which is now streaming on Amazon Prime, tells the story of a bunch of hotel management trainees working at a leading hotel in Delhi. Iteeva is currently studying at Gurgaon’s Shiv Nadar School. She loves playing squash and listening to music is her favorite pastime. Here, Iteeva talks about her experiences of working on October and how it influenced her while highlighting the challenges that she faced in trying to balance acting and studies. Q1. You play the younger sister to one of the lead characters in October. Tell us about your association with the project and how it all began? A. I met Shoojit da during the shoot of a Mirinda advertisement (#ReleaseThePressure) I had auditioned for earlier last year wherein I played a student oppressed by examination pressure. A few months later I got a call intimating that I had been chosen for October. Q2. How do you manage your studies while you are working on a film project? A. During the shoots, I was meant to be studying for my Unit Tests. But I had Varun Dhawan sitting opposite me eating chana. How was I supposed to study? There was too much excitement. But in many of scenes where I am sitting with a book, I was actually studying. Q3. How was your experience of working with Shoojit Sircar. How would you describe him? A. It was mind blowing, period. He is plain inspirational. He is simplistic and humble and has any eye for detail. He held my hand through every scene, and made sure I was comfortable enough to give my best. All he wanted was for me to listen, interpret and give my level best. I wanted to make sure he was proud. Q4. The film deals with a very serious subject and so the actors have to maintain a certain level of emotion throughout. How did you achieve that? A. Majority of my time was spent at the hospital, where the AC was on blast and the lights were low, and the only thing on my mind was the pain my character was going through. I have a sister, so to put myself in the character’s shoes was simpler. Watching patients go in and out all day just set the mood and the realistic make up helped stir the appropriate emotions. Q5. How was it like to work with other actors on the set? What kind of interactions did you have with Varun Dhawan? A. It was obviously an entirely new experience, intimidating yet exciting. Every individual of the cast and crew was supportive and helping. All that I could contribute was my 100% which I hope came through. Varun Dhawan is one of the humblest people I have ever met. He is warm, he makes great conversation, and he makes you laugh… I could just go on. In one of my scenes when I let the environment and the feelings get too deep Varun stepped on set to pull me out. He said “don’t let it get to you’’. And that was definitely one of my click moments. Q6. What was the biggest challenge that you faced on the sets? How did you deal with it? A. The biggest challenge would have had to be dealing with the emotions. It really did get heavy at one point. I dealt with it by being on the move, listening to music and drawing a distinct line between reality and my character. Q7. What are your thoughts on girls and women safety in India? How can cinema help in spreading awareness about the issue? A. Women and girls in India face the problem of safety all around: from their schools to their workplaces to their own homes. Women deserve representation, respect, love, security and so much more. Cinema is a great form of mass media that will help bring into light this disadvantage that women face in both Urban and Rural areas. I can only hope that we see a day when women can walk the streets safely. Q8. Has your involvement with October affected you in any way? What are your future plans? A. I feel like this movie in particular has made a significant change in me. It gave me an insight into a completely different world and gave me this amazing opportunity to interact with an esteemed lot of people. My future plans obviously include studying. But if the opportunity arises, I would definitely love to act again.